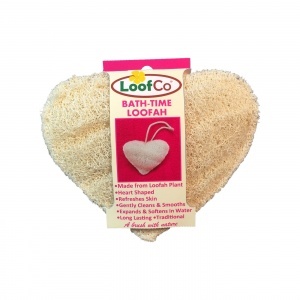 Loof Co Bath-Time Loofah pads are skilfully hand-made in Egypt from layers of natural loofah plant, stitched together to make a delightful heart shape. A 100% biodegradable alternative to plastic exfoliator pads. 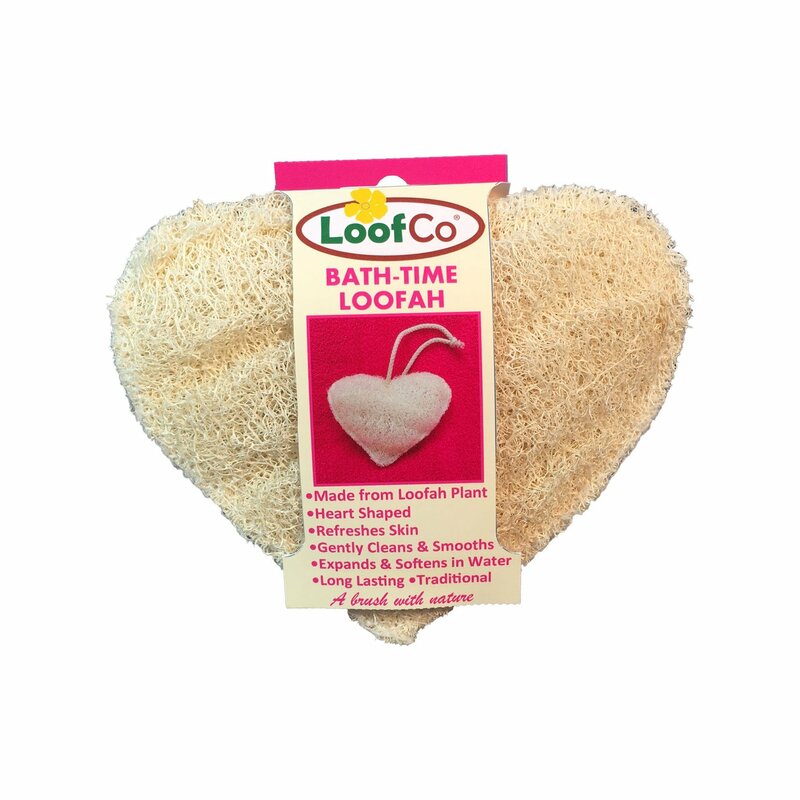 The Loof Co Bath-Time loofah fits neatly into the hand and when immersed in water swells up to become a soft, spongy and flexible pad. Each pad will last for months with normal use and when worn out can be composted. 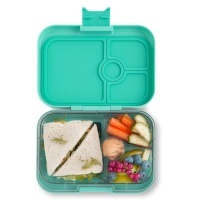 Each pad measures 15cm x 12cm with a convenient cotton hanging loop. Flattened for transport to save space. Rinse thoroughly before first use. In the bath or shower, use on damp skin with soap or gel in a gentle circular motion to clean, freshen, exfoliate and invigorate skin. To keep your loofah fresh between uses, squeeze out excess water and hang to dry from the cotton string loop. Occasionally wash in the washing machine or by hand if desired. Loof Co products are based on traditional designs that have been proven over generations and are highly effective for most washing and cleaning needs. When immersed in water, Loofahs transform and expand into a spongy, flexible yet robust pad. This makes them perfect for household cleaning, while also proving to be a soft, gentle skin exfoliator for your personal care routine. Coconut coir fibres remains stiff when wet, whilst also holding liquid, creating have excellent scrubbing power while remaining non-scratchy. Both plant fibres are durable enough to last for months! It is LoofCo’s mission to offer an alternative to mass-produced plastic washing-up brushes, pads and shower puffs that will not biodegrade. Our farming practises are sustainable and at the highest environmental standards. Our products are sourced from Coconut and Loofah plants, both of which are renewable raw materials that absorb CO2 when growing. Furthermore, we use coconut fibres and husks that are left over from coconut food and oil production which would otherwise be wasted or burnt. 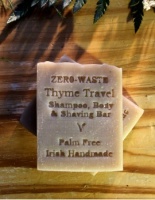 This makes our products 100% Biodegradable and Recyclable: Loofah and coconut is biodegradable and can be composted. The brush metal core and cardboard packaging is recyclable. LoofCo products are inspired by cleaning methods that have been tried and tested over generations. Using this knowledge, they are skilfully created in Sri Lanka and Egypt. This has helped to empower local farmers and production workers who are treated fairly with wages and benefits, such as medical insurance, higher than normal rates. Our Farmers create equal opportunities by ensuring that a percentage of their workforce are made up of those with disabilities, and stand firmly against child employment. In Addition, all LoofCo Products are Vegan. Some coconut producers use monkeys to aid with their harvest. LoofCo coconuts are not harvested in this way and are registered with the Vegan Society.